Digital Forms and Signatures coming next week! Recently the CMTO updated their Standards of Practice which we discussed on a previous blog. Next week, we will be releasing the digital forms feature which supports patient signatures to simplify and reduce paper required for their update. We wanted to let you know in advance because this will replace the current Clinic Policy & Terms feature. We went beyond basic functionality and included a complete Form Template tool. 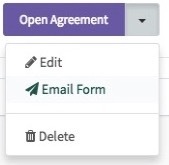 Manage multiple templates of form agreements. Provide a tablet or smartphone to the patient for an immediate signature. Modify forms for specific patients, and email them for agreement ahead of their appointment. Require signatures on specific forms, and include specific forms on your intake form. Maintain a history of agreements including their agreement status. What does this mean for my Clinic Policy & Terms? This new Clinic Forms will replace the Clinic Policy & Terms feature. Not to worry, we will migrate your current Clinic Policy & Terms settings and agreements into the new Clinic Forms when the feature launches.